Vultures and other birds of prey are persecuted throughout the world, either through hunting and the poisoning of carcasses, or indirectly through kite strings, wind turbines and the use of the drug diclofenac in livestock. Numbers of some species of vultures have experienced a drop of 99.9% in recent years. Through its Raptor Rehabilitation Prorgamme, WVI aims to ensure that as many injured birds as possible survive and are successfully reintroduced to the wild. Its veterinary teams, including avian vets Johanna Storm and Stefan Harsch and vet nurse Matt Rendle, are already working in India to increase the survival rate of injured birds and to increase their fitness at release. They are also training local vets and rehabilitation staff in pre- and post-surgical treatment and in surgical techniques. However, to ensure that its conservation plans for 2018 can go ahead, WVI needs to raise £18,000. To help veterinary practices encourage clients to get involved, it has created the hashtag – #vets4vultures – and an online promotion pack containing resources for use on their websites and social media platforms. 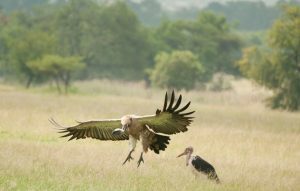 The resources explain the threats to vultures and other birds of prey and show how WVI’s Raptor Rehabilitation Programme is helping these endangered and iconic birds. Commenting, Olivia Walter, WVI Executive Director, said: “In contrast to popular depictions of vultures and birds of prey, they are beautiful animals. They are also an ecologically vital group of birds that face a range of threats which are causing their numbers to plummet. We must act quickly and our Raptor Rehabilitation Programme will significantly increase their chance of survival in some parts of the world.